Although Frederick McCubbin is best known for his affiliation with the Heidelberg school, his finest works arguably resulted from a subsequent period of relative isolation. During the final decade of McCubbin’s life, from 1907 to 1917, the artist mainly worked alone and in the open air, dividing time between his family home in Kensington Road, South Yarra and his secluded ‘mountain cottage’ in the Macedon Ranges, north-west of Melbourne. Frederick and Annie McCubbin purchased the cottage at Macedon in 1901, having discovered the property while celebrating Christmas in Woodend the previous year. Nestled within the bush, the cottage had been relocated to its present site on a bullock wagon from Melbourne some years earlier.1 Its design paid homage to the traditional English cottage, with a steeply gabled roof, front porch and attic windows.2 McCubbin named the property ‘Fontainebleau’ after the forest outside Paris, where the Barbizon painters had famously worked en plein air during the mid-nineteenth century. The cottage was to feature prominently in several of McCubbin’s works of this period; notably The Artist’s Studio, Macedon c1901-06, The Mountain Cottage 1915 and the present work, The Garden Window c1915-16. 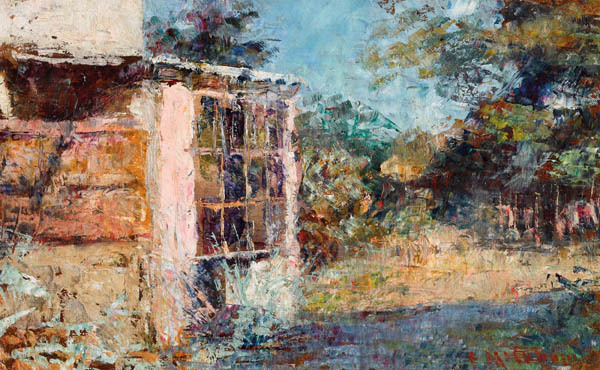 McCubbin’s later bush scenes demonstrate a distinct change in the attitude of the artist towards his immediate environment. In earlier narrative paintings such as On the Wallaby Track 1896, The Pioneer 1904 and Lost 1907, the bush forms a deeply hostile and disorienting environment for McCubbin’s historicised colonial subjects. In contrast, McCubbin’s later landscapes imply a far more harmonious relationship between human and natural elements, as the artist turned his attention from the hardships of Australia’s European ‘pioneers’ to the transient effects of light and colour in the bush. McCubbin’s working methods also changed during this period, as he largely abandoned the brush in favour of the palette knife - and with it, a greater focus upon painterly texture and surface. Working on freshly primed canvases and small boards, the artist ‘animated the entire surface of his pictures with fragments of scraped colour.’4 Rich variations in colour and texture would be further heightened through McCubbin’s use of a pumice stone to selectively abrade the uppermost layers of paint, exposing the underlayers and white ground beneath.5 This technique was ideally suited to McCubbin’s rustic subject matter, allowing him to impressionistically capture the most typical aspects of the Australian bush while also conveying a deep attachment to place. The Garden Window bears the influence of McCubbin’s visit to England and France in 1907, where he closely observed the works of JMW Turner, Claude Monet and Camille Pissarro. In a letter to his wife, McCubbin described Turner’s land- and seascapes as ‘dreams of colour […] mist and cloud and sea and land drenched in light [...] they glow with a tender brilliancy that radiates from these canvasses.’6 Accordingly, The Garden Window features vivid contrasts of colour and light, as the deep mauves and lilacs of the shadowed foreground run up against luminescent patches of yellow and green in the garden and surrounding bush. It is perhaps fitting that as McCubbin neared the end of his life, he chose to focus upon those most fleeting and intangible qualities of colour, light and shadow.